We are back with the monthly Android OS share that Google releases every month. And there is some good news. 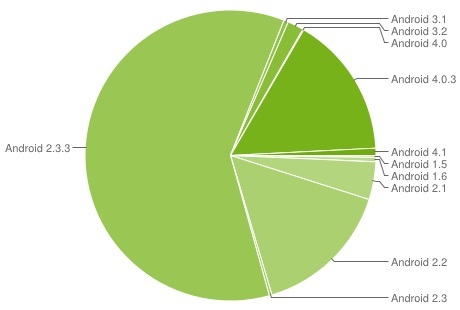 After months after its release, Android 4.0 Ice Cream Sandwich is finally catching up and eating into the share of other OS, specially the still ruling Android 2.3 Gingerbread. From the stats that Google obtains from the devices which visit the Play Store, Android 4.0 ICS is finally running on about 15.9 percent of all Android devices out there and this is a drastic jump from the last month’s share. Also this has reflected in the a downfall of Android 2.3 Gingerbread OS’s share which has fallen from last month’s 64 percent to this month’s 60.6%, thanks to the Android ICS roll outs by various manufacturers. Also the latest iteration, the Android 4.1 Jelly Bean is now successfully running on about 0.8% of all the Android devices out there as the update comes to the consumers with the availability of Nexus 7, roll out on Motorola Xoom and this is bound to increase as the update rolls out and more devices are sold. While Android 2.1 Éclair is still active on 4.2 percent, Froyo on 15.5 percent, and Honeycomb on a meagre 2.3% of Android devices.